Sonic Research Turbo Tuner ST-200 Review – Best Guitar Tuner? When it comes to stompbox guitar pedal tuners, there are a few products that have risen to the top as the most popular picks of most players. These products owe their success to their own merit as solid tuners as well as the huge marketing push their makers could afford. But what if there’s a product out there that blows away the competition and comes from a much smaller company, one you may have never heard of? In our Sonic Research Turbo Tuner ST-200 review, you may discover the best guitar tuner you’ll ever use. Visit Sonic Research for more info about the ST-200 Turbo Tuner. I have a confession to make. I’ve tried strobe tuners before but never really cared for them. I have always used digital needle tuners. I owned a Boss TU-2 for years. I then switched to the TC Electronic Polytune. But the Turbo Tuner ST-200 caught my attention for one simple reason: tuning accuracy within a .02 cent range. That sounded most impressive, so I thought I’d give this one a shot. As far as tuners go, the Boss TU-3 and TC Electronic Polytune 2 are arguably two of the most popular guitar tuner pedals available with the TU-3 claiming accuracy within +/- one cent and the Polytune 2 boasting a more impressive +/- 0.1 cent precision. However, just looking at this comparison, it’s clear that the Turbo Tuner ST-200 dwarfs the competition with its extremely precise +/- .02 cent accuracy. I plugged in my American Stratocaster (which I previously intonated with the TC Electronic Polytune) and activated the ST-200. I hit a low E and was greeted to a gently swirling strobe of red LEDs. Strobe tuners are generally easy to read but may take a moment to get used to for some. The Turbo Tuner lights rotate clockwise when you’re sharp and counter-clockwise when you’re flat. The idea is to tune a note until the lights are as still as possible. One thing I noticed right away was how quick the ST-200 responded to the string I plucked. Other tuners have an algorithm that takes longer to read the note, convert it to data, and display it accordingly. I never really noticed this slight delay in other tuners until using the Turbo Tuner. Essentially, the LEDs of the ST-200 give a real-time display of the note pitch in relation to the reference pitch. Want to test how sensitive and fast this tuner is? Hit a fretted note anywhere on the neck and add some vibrato or quick bends. The Turbo Tuner keeps up with an instantaneous display of swirling lights that quicken and slow at the exact rate that you change the pitch of the note. Kudos to the engineering wizards at Sonic Research for creating such a responsive tuner. And of course this pedal is true bypass if you’re one of the tone-obsessed. I also like how the ST-200 is completely cut out of your signal and from power when disengaged. No LEDs are lit when it’s off. This also means no drained batteries if you leave a cable plugged in. The ultimate test came for me when I checked my guitar’s intonation. I have always set up all my guitars myself. And even though I always thought I knew what I was doing, I now feel a bit silly to have relied on the +/- 1 cent accuracy of the Boss TU-2 at one point. The ST-200 will reveal the inferiority of less accurate tuners once you conduct your own intonation test. Simply set your intonation with one such pedal, then plug into a Turbo Tuner and compare on open note to its octave at the 12th fret. The extreme accuracy for setting up your guitars makes the ST-200 an essential pedal if you’re serious about the intonation and playability of your instruments. But that’s not all. The Turbo Tuner has 6 preset banks on front, easily selectable and programmable with two buttons on the top surface of the pedal. The Chromatic preset always allows for chromatic tuning while any of the other 5 banks may be configured for open and temperament tuning for instruments with up to 9 strings. I was amazed by the deep, yet simple customization of the Turbo Tuner once I delved in and started making presets. The only limitation I found was in that the reference pitch and flat settings are set globally and not per preset. This seemed like an issue for a moment. I actually called the customer service number in the manual to ask about this and a few other things. Someone was on the phone to help me in less than a minute! Sonic Research took my call seriously and showed great interest in the possibility of improving their products. The extremely knowledgeable and friendly service rep even gave me an ingenious workaround. Since I wanted to set the reference pitch of only one preset to A = 432hz, I was able to manually set the pitch of each string in a six string preset to -31.8 cents to achieve exactly this. I actually find this approach more useful than adjusting the reference pitch or flat settings globally. Setting up precise microtonal presets is a breeze. You can easily make presets for DADGAD, half step down tunings, or anything else. Do you play a True Temperament guitar? The Turbo Tuner has you covered with 3 True Temperament tuning presets built-in and references in the manual for programming them manually if you ever need to. The ST-200 works flawlessly with bass and acoustic electric guitars as well. It shows a precise, clear reading even on an instrument with an abundance of harmonic overtones. The ST-200 is a gem and is one of the finest tuners available. 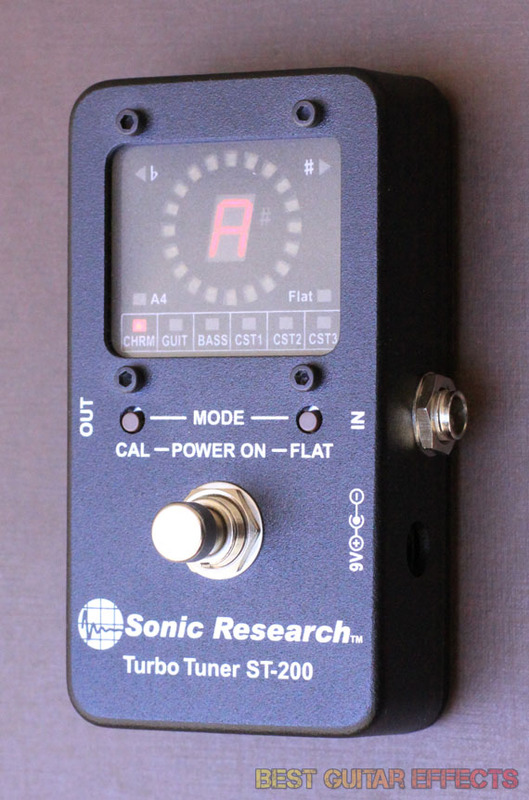 The Sonic Research Turbo Tuner ST-200 is the best guitar tuner pedal I have ever used. With unparalleled accuracy in such a compact true bypass enclosure, this pedal trumps the competition. Even as someone who has always relied on needle tuners, I adapted to the true strobe tuning of the ST-200 with ease. The six easy-to-use preset banks make the Turbo Tuner perfect for using with multiple instruments with any custom tuning settings you can imagine. Once you try the ST-200 you will never set intonation or tune your prized guitars with anything else. The Sonic Research Turbo Tuner ST-200 is truly a world class tuner and has earned its place as the new tuner on my own pedalboard. It deserves a place on yours, too. That concludes our Sonic Research Turbo Tuner ST-200 Review. Thanks for reading. 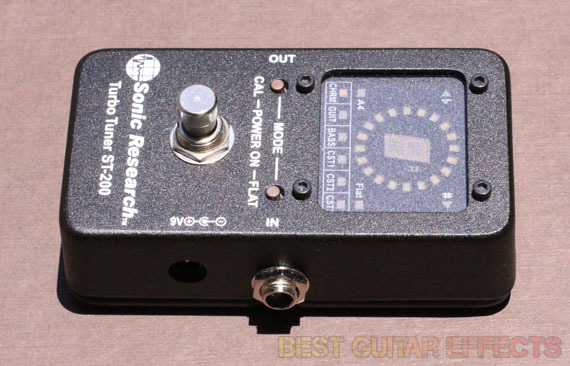 Want to buy the Sonic Research Turbo Tuner ST-200? HI dear… You said that turning the pitch on every single string would be better than adjust the reference pitch of all… I wanto to set one of the memory bank as a 432HZ. So, how do i do to turn this better? Decrease 31.8 from the 440HZ? If you want to only tune to 432Hz, then you could set that as a global setting. If you only want to set some instruments to 432Hz, you can make a 432Hz preset by subtracting 31.8 from each string (31.8 being relative from the standard pitch of 440Hz). This information was provided by Sonic Research when writing our review. Consult their manual for how to make presets, and feel free to reach out to them for more information. Good luck! This is the first I’ve heard of this company. Love the fact that it’s super responsive. Sometimes a good review can really sell the item; this is one of those times. Have you compared with the Peterson tuners? Yes, this one is much better – it’s faster, it holds the note longer, and it’s more accurate. I had a Peterson VS-something (virtual strobe) and I switched to this ST-200 one. And this one is just about as accurate anyway. BTW, this one is a true strobe, not virtual. I’ve been using mine for maybe two years now, and it’s been flawless. It’s just killer. I don’t mean to squee, but getting one is a no-brainer! this thing puts my boss tuner to shame !!!! Great review BGE !!!! Looking forward to a side-by-side comparison between my Boss TU-3 pedal & the Sonic Research Turbo Tuner ST-200! Fingers & toes crossed! I’ve been looking at this tuner for a while. It’s good to find such a positive independant review. Glad I stumbled across Best Guitar Effects while researching another pedal. Looks like a great resource for the working musician. And the Turbo Tuner ST-200 sounds like it would make a great addition to my pedal board. Looking forward to adding it to my repertoire. Sonic Research Turbo Tuner ST-200 sounds just what im looking for. Thank you for a great review, I need to check this pedal out asap. I’ve been looking for a good tuner pedal. This would be nice. Should be industry standard for on-board tuning; great for setting intonation accurately. Great visibility in a variety of indoor/outdoor settings with variable lighting situations. The difference between .02 and 1 cents seems hard to imagine without hearing it. I need to check this pedal out. I love my TC Electronics tuner but the options offered in this pedal might have me changing my tune. Great review! Most be a great tuner. If it is good for Matt Schofield it would be more then good for me. I’ve owned this pedal for about 5 years now. It performs flawlessly and is the only pedal I truly trust to keep me in tune. I love the “MUTE” function when it’s turned on. No ugly sound while tuning. Turn it off and you’re back in business. I’ve only had to replace the battery twice since it was new 5 years ago. Oh and I almost forgot, you can adjust your intonation. That’s something that will save you a hundred bucks every time you do it. The only drawback to this pedal is I don’t have two of them. When I first used these, I was pretty confused. But while looking into it, this pedal should def make a great addition to my board! Tuning is good! So was this written review. I read about this tuner and it is one of the more “accurate” tuners from everyone’s perspective. And if your not playing in tune. Well your audience is dying. Next thing you know your playing for crickets! Every one wants to stay in tune.This pedal sounds like a winner. Yeah, there is always a problem with other tuners when setting the intonation od 12th fret. If it’s really catching the intonation as it should it would be a gem. Now that would put me in the 21st century,I`m still using my 28 yr old analog tuner ! You guys are awesome for doing these giveaways ! Ive read about this for the past few months, but havent read any thorough reviews, and after this, im totally sold !! thx bestguitareffects !!!! Great review for a great tuner. The speed and accuracy is second to none. I want this tuner! Got a cheap fender one, and there is just no comparison! Thanks Best Guitar Effects for a great site to check out reviews on pedals. This Turbo Tuner ST-200 looks and sounds like a winner! I like the fact that it turns off when not in use and you don’t have to remember to unplug the input cable to save the battery life (a constant frustration of mine, doh!! have to replace the battery again). I sure could use this sweet tuner, pick me. If my polytune ever dies this is probably what I’ll pick up. Or maybe I’ll get to compare the two. Think i’m sold, the response on tuners is one thing that’s always bugged me. Sounds like a great tuner, but I do like the buffer on my Boss. Now that everyone’s making True Bypass pedals, my Boss tuner is like the only pedal I have left in my signal chain with a decent buffer. Drat, I guess this means I need to just go get a buffer pedal and a real tuner. Why couldn’t I have just gotten myself a less expensive hobby. allways plug my old analogic korg. I wish I had not just bought a Behringer tuner pedal…. I’ve always had some issues with the accuracy of my tuners, especially when it’s come to checking intonation, but hey– they’re “close enough for rock and roll”, right? Not anymore, it seems. This one is loaded with features I’ll probably actually use, it’s accurate, and I’m a huge fan of true bypass. It is a few dollars more than the competition but in the long run, you get what you pay for– and my satisfaction is priceless. Thanks for the great review! I have a Polytune mini too. I honestly really doubt that 0.2 cents will make a difference from Polytune’s 0.5 cents. IMHO that difference is no longer discernable to the average human ear. Actually, a super accurate tuner will increase the time it takes for you to tune live… Worth thinking about. I’d rather choose fast, less accurate tuning than a very accurate tuner which when your guitar is heard, doesn’t really make a difference to your audience. If you have to choose this tuner is should be because of its versatilily/customizability. In the market for a new pedal tuner and I’m highly attracted by its accuracy. Hoping to own this one soon! I was considering adding a Peterson strobe tuner to the gear for Musical Directions, which is a non-profit youth outreach, but your review of the Sonic Research Turbo Tuner has given me an option to consider. Not only does the Sonic Research Turbo Tuner have a greater accuracy than the Peterson Stomp Classic Pedal Tuner, it is available at a far lower price point. While the Peterson offers USB & DI, I do not think that warrants the third greater price point. 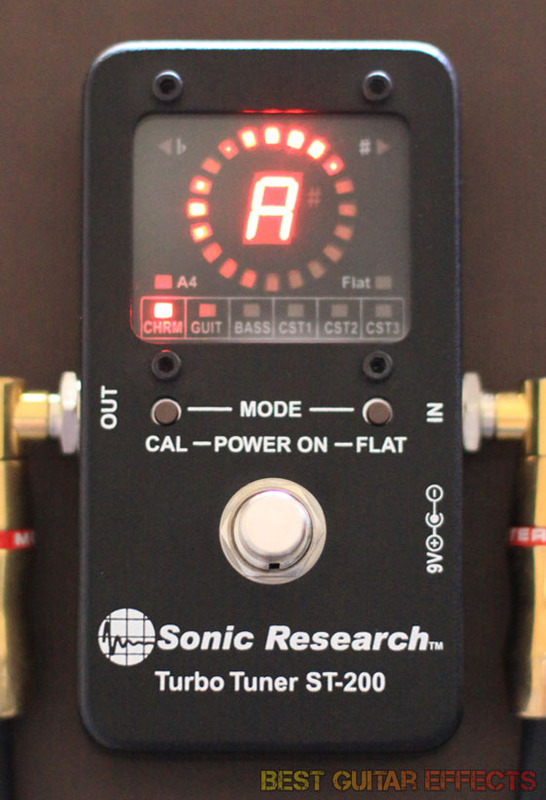 Sonic Research also offers a handheld tuner which offers greater versatility and may be the best route for our situation. Thanks for bringing Sonic Research to my attention. Ok this may give my pitchblack + a run for its money,would love to put it through a real test and review,with some on stage uses. Sounds like a great tuner pedal – far more accurate than the tuners I’ve been using! I’d definitely love to step up to this best of the best tuner…fingers crossed…! I would appreciate the responsiveness of this tuner, the tuner I use could certainly take a lesson. I have the Boss TU-2, need a change, maybe this one. Nice tuner. Love the features. It seems one of the better tuners out there, and I have no clue why I haven’t heard of it before. Probably could easily replace all of the tuners I own. This kinda puts my tried and true Boss Tuner to shame. This would be a great replacement for my Line6 shortboard tuner!! Always cool to see a tuner that does what hundreds haven’t done better before. Im interested! I’ve been playing for nearly 30 years, and the whole time, I’ve used cheap tuners – an old boss analog type, compact boss digitals, built in tuners in my Line6 product, and clip on headstock tuners by Snark. I’ve always thought I was satisfied with my tuning, but I always wondered why when I tune, it never sounds as good as when I get a professional setup, no matter what guitar or string combination. It’s got to be the tuner, but when ever I go to buy a good tuner, I don’t ever have the money to buy a good one, so I always have to settle… I’d love to have a tuner like this on my board. So much want. I’ve been using the tuner in an old digitech multi-effects unit until I can get a good one. Definitely gonna have to keep this one in mind. A strobe tuner with .02 cent accuracy with programmable preset banks in a stomp box? This would be a great blessing – I set up my own guitars and could surely use a Sonic Research Turbo Tuner ST-200! All I have is a cheap $8 hand held tuner. After reading this review I feel I have been “cheap” too long! Time for an upgrade. I feel like every great pedalboard starts with a good tuner. Would like to get hands on with this one. Was considering purchasing a new polytuner from TC, but I think I just changed my mind! Cool – I love that you can make settings for alternative tunings – I have yet to get a tuner for my board, but this one might just do it! Always wondered about the turbo tuner, still not sure if I’m going to make the switch since my tuner is out of my volume pedal but I’ll definitely consider it! Great review! this certainly seems like the leader in pedalboard tuners. the design and function of the stompbox make it a win-win in my book! Thank you for the review. Once again nice to learn that the tuner I purchased a few years ago can’t compare. I have come to enjoy BGE reviews in a very short time, honest and not sponsor driven blind endorsements. Regardless of the give away I will now give serious consideration to the Sonic Research Tuner to replace my rather inexpensive clip on unit. Keep up the good work. Very nice. I’ll take one! Plenty of features and the accuracy make me want to check out this tuner. A good, accurate tuner would be a nice addition. i love the pdls and info !!!! good job guys!! !